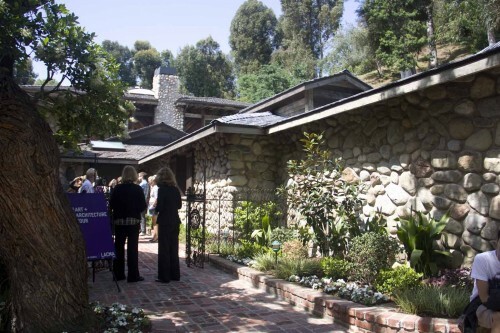 Los Angeles enjoyed its customary sunshine last Sunday, making it the perfect time to peek inside some of the city’s most exclusive historic homes, thanks to LACMA’s Art Museum Council, the museum’s volunteer support group. The council has been putting up an annual art and architecture tour, supporting the museum, for the past 56 years. In this year’s run, the council shared four homes of varying styles. AN was afforded a glimpse of the high life, not to mention lessons on how to display a LOT of objects. The tour included two homes east of the museum. 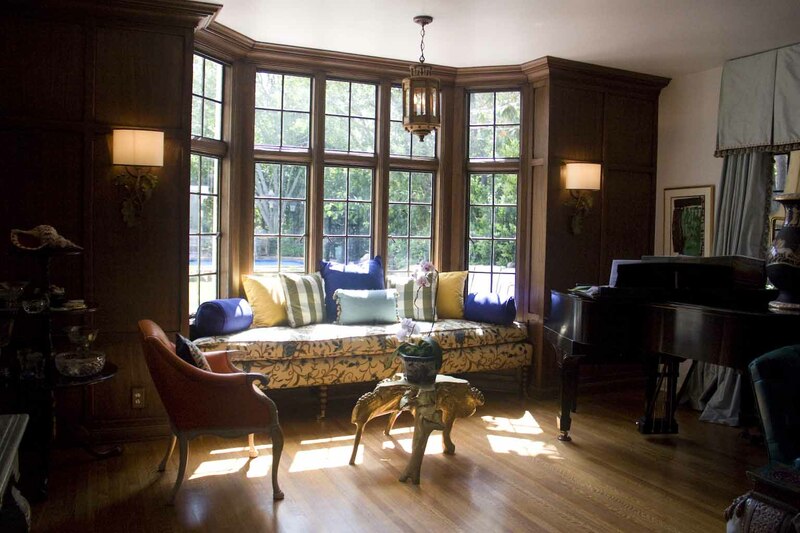 The first was a landmark Tudor Revival on Windsor Square, designed by Arthur Rolland Kelly. Although renovated, it still features its original steel windows and stained glass artwork. To open up the space, the homeowners tore down a wall just beyond the doorway, where they found pre-existing archways. Looks like Kelley had the right idea after all. The home has an Old World charm, complete with handcrafted metal spoons made by Joe Spoon, a 1930s breakfast table from Wisconsin, and a pinwheel-painted floor that goes from the kitchen to the living area. The second east-side house may be familiar to readers of Architectural Digest, since it was featured in the magazine’s April issue. 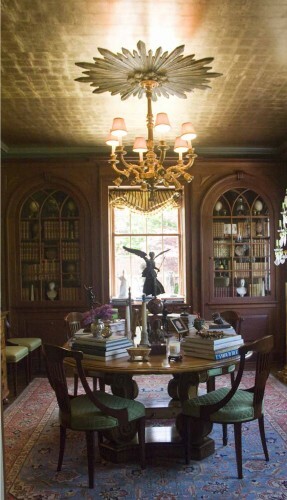 The Hancock Park residence was interior designer Timothy Corrigan’s childhood home, which he once again re-acquired. He apparently sent the previous homeowner a childhood picture of himself playing in the swimming pool with a note that said, “Please let me come home.” Who could say no? Corrigan re-worked some of the Georgian Colonial’s original plan. He tore down walls to expand the 5-bedroom layout to a larger 3-bedroom one. He merged a small kitchen, back hallway entry, and maid’s quarters to form a long, open kitchen. On the second floor, he added a nautical skylight. The home effuses opulence with a light touch. Obelisks sit alongside finds from the Dorothy Chandler estate, Caravaggio paintings, and even a resplendent mahogany cabinet that once belonged to Catherine the Great. In the dining area, an oak table sits under a gold leaf ceiling and is surrounded by silk wall panels. Luxurious, but strangely not overwhelming. West of the museum architect Alfred Wilkes’ mid-century modern in Trousdale Estates was a nice change of pace from all the tradition. It featured one long, flowing plan incorporating entrance, dining room, kitchen, living room, and bedroom. 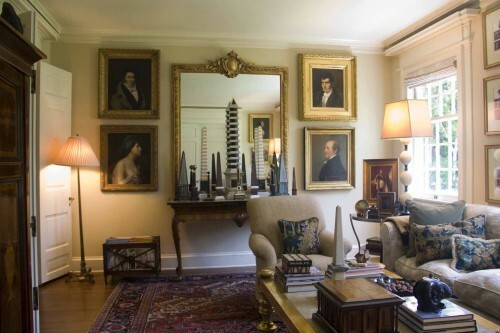 The owner discreetly added a few walls for artwork and storage. The home has an impressive kitchen—four ovens, three sinks, five dishwashers—but that’s just the tip of the iceberg. Pieces displayed sophistication mixed with a lively sense of humor. In the dining room, the far wall displayed shadow puppet drawings. 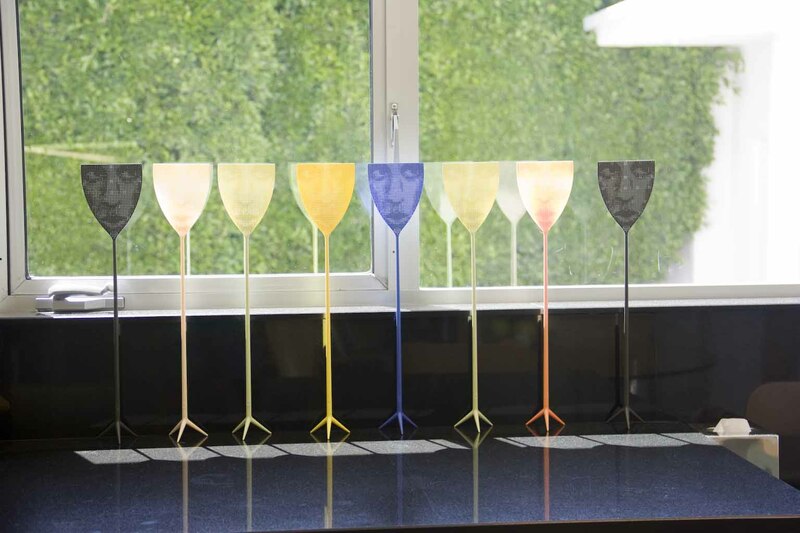 In the kitchen, a colorful collection of Dr. Skud fly swatters by Phililppe Starck sit opposite a framed collage featuring the owner’s daughter’s ice cream drawing surrounded by bright ice scream scoopers. In the living area, the owner displayed “Corridor,” an infinite illusion piece by artist Chul-Hyun Ahn. Our last stop was an eclectic home above Coldwater Canyon, which despite its rustic exterior is quite refined—and unusual—inside. The owner’s love of Art Deco and Art Nouveau shows itself in the staircase, a reproduction of the Savoy Hotel’s in London, and in the opulent master bathroom, where step-tiered skylights are reminiscent of Mayan ziggurats. To top it off, Hagenauer sculptures show up in all parts of the home.